With 630 Male ' capsule ' rooms, one of the largest capsule-style hotels in Japan. FREE Internet LAN cable available. And it's the only property that has spa facilities in Shinjuku central area! Only 5 min walk from JR and subway Shinjuku Station. 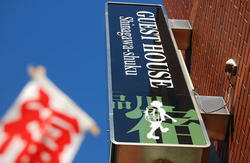 Enjoy the Free Fast Wi-Fi and Power Outlet for 4300JPY per night. The Standard capsule is just 3500JPY per night. 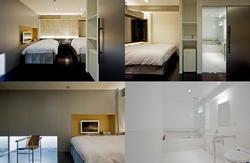 A high quality, low priced Capsule Hotel with 630 cell rooms at Shinjuku Kabukicho. Roof-top open-air hot tub and onsen hot spring bath available. You can't leave Japan without experiencing this neo Japanese style lodging! 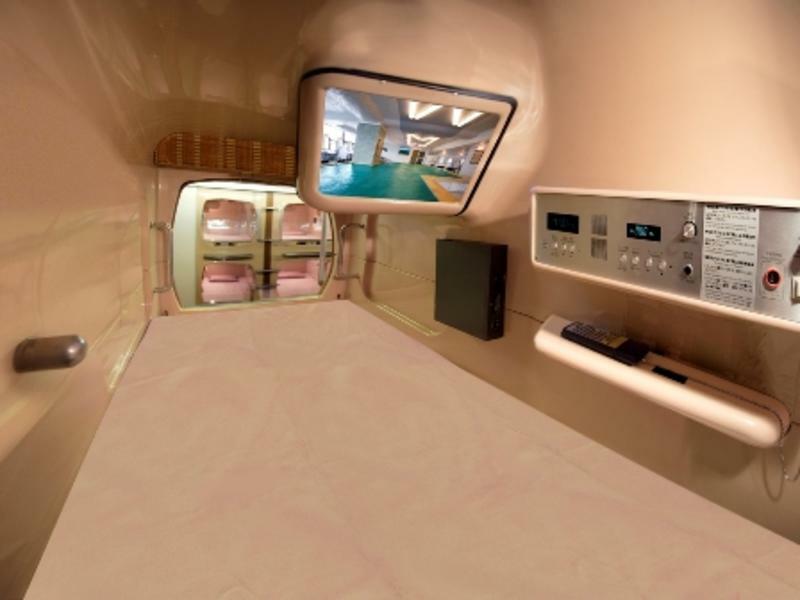 You can sleep in your personal 'Capsule' like a tiny room, 190cm (6' 3') depth by 100cm(3' 4') width and 90cm (3'0') heights each and yet features amenities such as a TV, radio, alarm clock and adjustable lighting. FREE Internet access (LAN connection) and PC 100yen / 15min is available in lounge. Capsules are lined as double deckers. Each capsule is air conditioned and equipped with TV (by Sharp AQUOS), radio, alarm clock, personal light. Amenities include a shampoo, soap, tooth brush, towel, razor and a robe. On TV, some bilingual programs available depending on times. Facilities include an outdoor bath and jacuzzi, big bath tub (mineral water), saunas, restaurants. Please note that guests who stay 2 nights or more are required to go out of the room with all the belongings by 10AM everyday. This is due to daily facility cleaning. Lockers for luggage available. You may come back after 3PM. We accept major credit cards such as VISA, MasterCard, JCB, American Express and Diner's Club. -Guests who stay 2 nights or more are required to go out of the room with all the belongings by 10AM everyday, this is due to daily facility cleaning. Lockers for luggage available. You may come back after 3PM. 5 minutes walk from JR Shinjuku Station East Exit and subway Shinjuku Station. Walk toward north (to the direction of Seibu Shinjuku Station) and pass by the Shinjuku Prince Hotel on your left. We are right in front of Seibu Shinjuku station. We recommend that you print-out the Google Map available on the booking web site. You can show any Japanese walking on the street to get the right directions when you are lost.